Tofu has a great reputation with most everyone who has eaten it. Tofu does not have the best name with those who have yet to give it a shot. Many people believe it will be tasteless, with an unsettling texture. However, there are many recipes that can include tofu, and come out of the oven or off the stove utterly delicious. Tofu can be used in pies, sandwiches, soups, and so on. You could create both an entrée and dessert, and have your self-proclaimed tofu-hating friends loving every bite. You might begin with marinated tofu pita sandwiches and roasted potatoes. 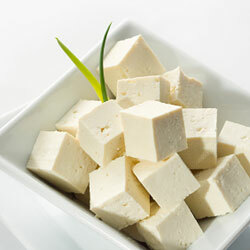 To give your tofu a meatier texture, purchase a block of extra firm tofu, and freeze it. Thaw it completely before you cook it. Once your tofu is thawed, slice it and wrap it in (a lot of) paper towels, which will remove the excess moisture from the tofu. It is a good idea to lay a cookie sheet on top of the sliced, papered tofu. On top of that, arrange some heavy canned food items to add some weight, which will rid the slices of tofu of the water it was packed in. Once the moisture is gone, the tofu will be ready to cube and marinate. Prepare a marinade of steak sauce and Worcestershire sauce. Allow the tofu soak up the mixture for about ten minutes. Drizzle a pan with olive oil, and place on medium high heat. Once the oil is hot, add the tofu to the pan. Fry the tofu, occasionally turning with a spatula. The tofu will take about ten minutes to cook. Once it is done, add the tofu, along with some fresh spinach, sliced roma tomatoes and a little extra steak sauce to the pocket of a pita. Enjoy. The roasted potatoes can be prepared in about ten minutes, but will take about 30 minutes to cook completely. First, preheat the oven at 400 degrees. Cut the potatoes (new potatoes work nicely) into eighths. Drizzle with olive oil, and mix until all the potatoes are covered. In a plastic baggie, sprinkle two tablespoons of paprika, a teaspoon of salt, half a teaspoon of cumin, and a dash of crushed red pepper. Place the potatoes in the bag, and shake until the potatoes are covered. Place on a baking sheet, and bake for 30-45 minutes, until the potatoes are crispy and golden. To create a yummy chocolate cream pie, you will need a block of silken tofu, named for its wonderfully smooth texture. You will also need, two cups of chocolate chips, a teaspoon of vanilla extract, a tablespoon of honey, whipped cream, and a crust of your choosing (a favorite is a chocolate wafer crust, available at most grocery stores). Place the chocolate in a double boiler and melt it before stirring in vanilla. Place the tofu, the honey, and the chocolate in a blender and liquefy until mixed completely. Pour the filling into the crust and chill the pie in the refrigerator for about two hours. Cover the pie with whipped cream, and devour rapturously. Stephanie Parker is a preschool teacher and freelance article writer, living in Kentucky. She loves to contribute articles on food and cooking, as well as healthy living.